America is hungry for the voice of an honorable leader. I have been listening to such a voice — the voice of Admiral William McRaven. McRaven, now retired, is a Navy SEAL who rose to become the leader of the U.S. Special Operations Command. He was the architect of the raid that killed Osama Bin Laden. 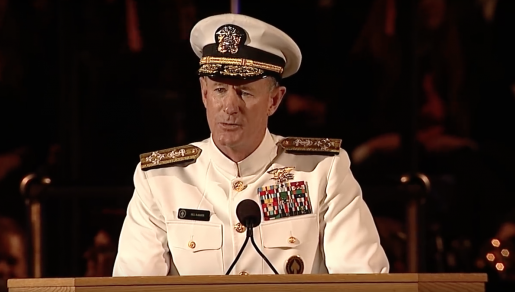 In 2014, McRaven gave the commencement address at the University of Texas at Austin. The speech went viral. More than seven million people have watched it on line. Wavemaker Conversations is proud to present the audio of that address at the end of this article — 20 minutes of uninterrupted inspiration. Why now? “If you want to change the world…” is McRaven’s refrain. He leads us through ten lessons he learned in SEAL training that, he hopes, can help us on our way to a better world. Please listen to this 80-second excerpt, and imagine how unifying and elevating it would be if this were the tone and spirit emanating from our nation’s leadership. … I can assure you that it matters not whether you ever served a day in uniform. It matters not your gender, your ethnic or religious background, your orientation or your social status. Our struggles in this world are similar, and the lessons to overcome those struggles and to move forward — changing ourselves and the world around us — will apply equally to all. John Brennan … is one of the finest public servants I have ever known. Few Americans have done more to protect this country than John. He is a man of unparalleled integrity, whose honesty and character have never been in question, except by those who don’t know him. Therefore, I would consider it an honor if you would revoke my security clearance as well, so I can add my name to the list of men and women who have spoken up against your presidency. The midterm elections are on November 6th, and represent an opportunity to vote to put a check on a president who, day in and day out, dishonors our nation. What does it mean to be honorable? Webster’s dictionary defines honorable as “worthy of high respect,” and includes such character traits as honesty, fairness and integrity. America is hungry for the voices of honorable leaders. Admiral William McRaven’s commencement address  is a good place to start. To subscribe to the Wavemaker Convesrations podcast for free on iTunes, please click here . For Android click here . For an excellent, short profile of Admiral McRaven, click here .